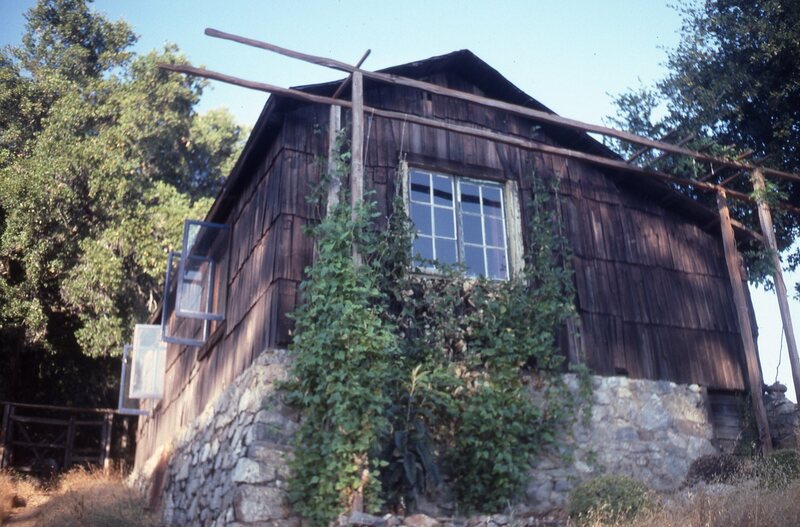 On January 1, 1980, Jeff Norman, then 29, moved into the Overstrom homestead, Alta Vista, in Big Sur. Overlooking the ocean from a 2,700-foot-high perch on Michael Ridge, and accessible only by trail, Alta Vista was an ideal location for observing and experiencing the beauty and power of the natural world. Jeff lived at Alta Vista until his death, at age 56, on October 31 2007. All structures associated with Alta Vista were burned to the ground eight months later in the Basin Complex Fire. Fortunately, journals covering the years 1980-1991 were removed from Alta Vista three months before the fire and escaped immolation. They are essentially weather journals, kept to maintain a record of rainfall and other meteorological events, but other information (car trouble, animal issues, the discovery of rare plants, the constant struggle to avoid foreclosure, etc.) had a way of seeping into them. Anyone wondering what it’s like to live without modern conveniences in a modern world, should find these texts interesting. But anyone who spent time in Big Sur during the years these journals cover, will likely find more than a few old memories reawakened. The journals, as presented here, have been transcribed and lightly edited for readability. Some limited annotation has also been provided. Some days and months are missing, as Jeff did not always keep up with his journaling, and we have excluded passages inappropriate, in our view, for a general audience (those that reveal the location of sensitive archeological or thermal resources, for example, or include especially harsh assessments of particular individuals – however accurate they may be). We have also eliminated portions that, in our opinion, are simply too focused on weather minutiae to be interesting. The writing in the journals is not always easy to decipher and we apologize in advance to those whose names have been misspelled (either by Jeff or through our poor transcription). Please Note: These are relatively large .pdf files (the largest is almost 47MB). They can sometimes take a few minutes to load. This entry was posted on Friday, February 25th, 2011 at 12:31 am and is filed under Big Sur, Fire, Flood & Apocalypse, Fungus, History, Insects, Plants, Santa Lucias. You can follow any responses to this entry through the RSS 2.0 feed. You can leave a response, or trackback from your own site. You guys don’t post often but when you do it is usually golddust! Just ploughed through ’81-’85 of Jeffs’ journals – obviously a lot of mundane material but SO evocative…. the Spring of 1983 is a long time ago but so fresh (living on Partington) in the memory – the endless deluge, the double slide, Skinner Pierce, helicopters flying in nets full of gas cans, trucking garbage out – incredible! Jeff, Howard, Pat, Jack, Walter….Big Sur legends! A truly magical place which nurtured and was nurtured by Jeff’s remarkable love for Big Sur in all its myriad forms and meanings. Thanks so much for transcribing these – I’ve had the tedious but enjoyable task of doing much the same for a late sailor friend and it was very rewarding for me and for his other friends and relatives. Do you know if Jeff stopped keeping journals in 1991? I know he was a meticulous record-keeper. I know his sister Cynthia, and II visited Jeff on many occasions between the early ’80s and early 2000’s and have many fond memories. If Jeff kept journals beyond 1991, they either haven’t yet been found or they were lost, like so many, many things, in the fire. Thank you so much for sharing these, I look forward to reading through the entire collection. It would be wonderful if the post-1991 writings turn up. My father was, Don Clark (Donald Thomas Clark) who appears often in the later journals “Worked on letter to Clark…” as they were corresponding about Dad’s book on Monterey County place names. He had enormous respect and regard for Jeff, as do I.
this blog is indeed amazing. i met jeff norman once by accidentally hiking right up to his cabin in 1991. i had no idea what i was doing but was determined to make it to rainbow camp via the big sur trail. i had a friend drop me off on HW1 near julia pfeiffer burns and i was off. how i made it up to that cabin i’ll never know. he was initially miffed that i was trespassing, but in no way rude. after a brief conversation we realized that he knew my father who once owned part of a cabin on the coast ridge in the early 80’s and that we had actually met back then. he very kindly cooked a modest dinner for me and let me crash on his couch. we talked henry miller, shakespeare, santa lucia firs and god knows what else. he was a big sur encyclopedia who seemed to fit right in with the madrones and chaparral. i headed out, free form, up to the cold spring camp.the next morning grateful for the company. and that’s my story.